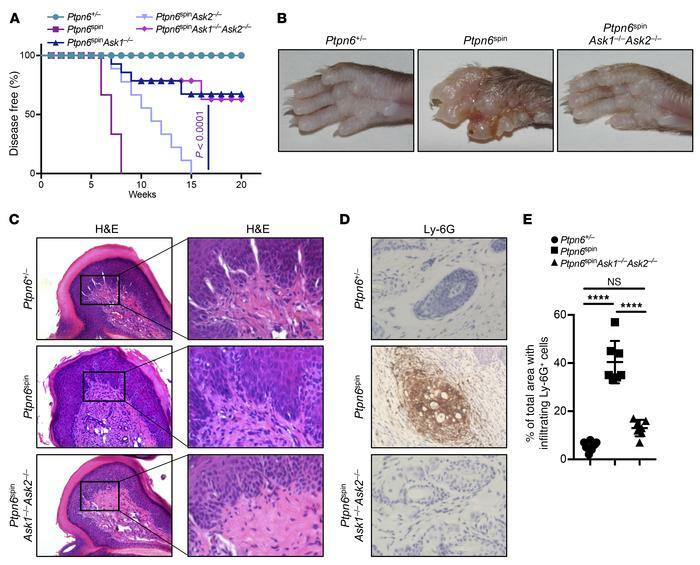 Deletion of ASK signaling ameliorates cutaneous inflammatory disease in Ptpn6spin mice. (A) Ptpn6+/– (n = 16), Ptpn6spin (n = 25), Ptpn6spinAsk1–/– (n = 12), Ptpn6spinAsk2–/– (n = 9), and Ptpn6spinAsk1–/–Ask2–/– (n = 28) crosses were observed for disease progression. (B) Footpad images, (C) H&E staining, and (D) immunohistochemistry staining of neutrophils (Ly-6G) of Ptpn6+/–, Ptpn6spin, and Ptpn6spinAsk1–/–Ask2–/– mice (original magnification, ×20). (E) Quantification of the percentage of total area with infiltrating Ly-6G+ cells shown in D. Disease curves in A were analyzed by Mantel-Cox log-rank test. (E) Two-way ANOVA was used to determine the significance between the 2 groups analyzed. NS, not significant. ****P < 0.0001.